Each fall, three Katharine Malone Prize recipients are named. In 1985, Claudine B. Malone ’63 established the award in honor of her mother, Katharine, in order to recognize Wellesley students who exhibit academic excellence combined with proactive engagement with their community. The Malone Prizes are among the most prestigious academic awards a Wellesley student can receive during her undergraduate years. At Convocation this year, Katherine Tran ’15, Erin Altenhof-Long ’16, and Zoe Peeler ’17 (left to right in photo) were announced as this year’s recipients. Erin Altenhof-Long is a computer science and English double major from Vancouver, Wash. She loves the atmosphere at Wellesley and the interests she has pursued on campus that allow her to learn continuously. 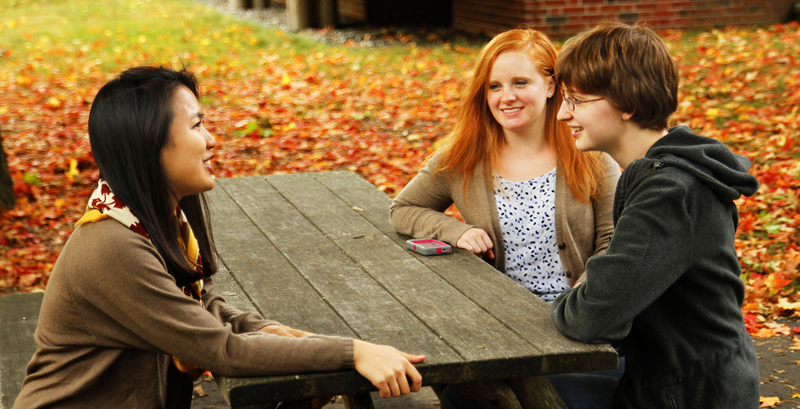 Erin has served as a copyeditor for Wellesley News since arriving on campus. In her first year, she was also a member of the College’s Quizbowl team and was involved in helping the PHOCUS Photography Club to become an official campus organization. She has been an academic peer tutor for her residence hall and a tutor and teaching assistant in computer science. “The professors in the computer science and English departments who have challenged me, complimented my work but still given me constructive criticism, and overall encouraged my dedication and perseverance have reinforced my belief and inspired me to take on opportunities,” she says. Encouraged by faculty as well as Wellesley alumnae and student presentations at the Tanner Conference, Altenhof-Long applied and received an internship at the Google Engineering Practicum program last summer. “In the same way that I believe we can learn anything we put our minds to, I believe that women can break into historically male dominated fields like the tech industry, and I'm hopeful that I can encourage more Wellesley students and young women in general to study computer science,” says Altenhof-Long. “I've been told: Chief justices come and go, but the Honor Code remains,” says Katherine Tran, Wellesley’s chief justice and this year’s Katharine Malone Scholar. “If I can inspire people to prioritize the fairness and well-being of our community, I’ll be thrilled.” As chief justice, Tran oversees the Honor Code Council and educates the community about the College’s Honor Code. This is just one of the ways Tran engages with the community. She is from Beaverton, Ore., and majors in chemistry. In her first year, she began studying the interactions of low-energy electrons and condensed matter with Chris Arumainayagam, professor of chemistry, an experience she describes as transformational. Under his guidance, she has participated in the Beckman Scholars Program, conducting research at the University of Sherbrooke Medical Center in Quebec and meeting fellow Beckman Scholars from across the country. Outside her courses and laboratory work, Tran has worked as a math grader, a chemistry tutor, a research assistant, a physics teaching assistant, and a volunteer at the assistance hotline run by Samaritans, Inc. She has also been involved with the Hippocratic Society and has shadowed residents at Brigham and Women’s Neonatal Intensive Care Unit. In alignment with Katharine Malone Scholar principles, Katherine’s curiosity compels her to understand the diverse narratives of those around her. Her continual goal of expanding the perimeter of her comfort zone has led her to interact with and serve all sorts of “interesting, quotable, and unforgettable people.” She says, “It’s such a delightful puzzle to truly figure people out. People surprise me all the time.” Tran credits her friends, peers, and professors for influencing her in unexpected ways, as well as her family—including her parents, her Wellesley alumnae aunts, sister Natalie '14, and twin Audrey '15. Katherine also sends her gratitude to Claudi Malone, the Malone Committee, and the namesake of the award herself. The First-Year and Sophomore Prize winners receive $10,000 and the Malone Scholar receives $50,000 plus $40,000 toward graduate studies.